This page is to help members, both existing and new find out what to bring along and what sort of guns you will need to get the best out of your shooting at Dorking. Aside from your personal stuff including warm / wet weather gear and stout boots flask of coffee etc there is some confusion about what sort of actual Firearm you will need and if you have firearms already which are suitable for what day. We have several people who bring along sporting rifles (nothing wrong with these in itself). Whilst these are fine for hunting they are generally zeroed at shorter ranges and lack suitable adjustable target turrets on the scopes so you can move between the ranges and know your zero at each distance. It is not acceptable with the use of electronic targets so go to a distance and shoot away in the hope that you will eventually hit the target. If you can’t get on within 3 rounds you will be asked to leave the firing point and get your rifle zeroed. The targets are highly vulnerable to a strike on the edge and if the wires are hit then the whole system goes down. We will be stricter in future about what rifles are used on the range. Don’t forget there are some good smart phone ballistic calculators to help with your zero between ranges. A Target Rifle, Suitable for all Target Rifle Competitions in the calender. A Scoped Rifle for used in the McQueen and Scoped Rifle Competitions. These can be shot on TR days provided you stick to the days course of fire and any with Muzzle breaks are kept away from the TR Competitors. Note this has a scope fitted with minute adjustable target turrets so the zero can be changed and recorded between distances. Modern Tactical rifle for McQueen’s, Scoped Rifle and Modern SR.These are a good choice of you want a single all round gun and with the right ammo will easily shoot at 600 yards or with a low power tactical scope can be used int the Modern category of a Service Rifle Shoot. Classic Sniper Rifles, for use in the McQueen (Classic) competition. 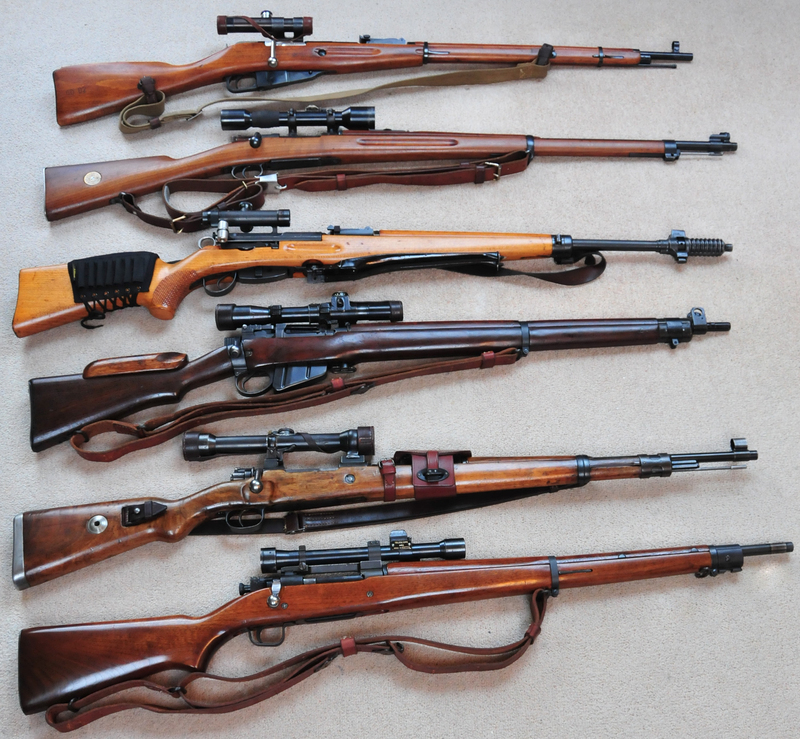 Top to bottom, Mosin Nagant M91/30, Swedish M41B, Swiss ZF55, Long Branch No4T, Mauser K98, Springfield 03A4. This is a selection of things you can use and there are many many more. Members have all manner of things but try to bring the right gun to the right comp to avoid disappointment.